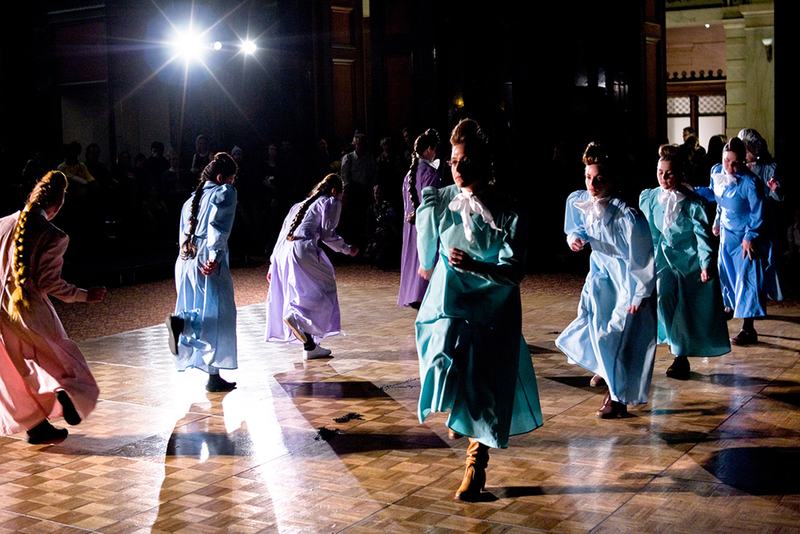 First shown at the Phoenix Art Museum in 2011, this video was made using the installation Well, I've Been Standing Here, that re-imagines the social and emotional dynamic among women within the close-knit polygamist communities, placing the sister-wife at the center of her experience with the power to have her own visions and revelations. Ellsworth's sister-wife is in constant motion on the stair-stepper, shifting her weight in an alternating pattern of contrapposto poses. She is at once monumental and weightless but most importantly, a self-determined figure who is firmly in control of her being, actions and destiny. Merging an American-born dance craze with an American-born polygamous sect in order to explore ideas of membership, rituals of endurance, and non-heteronormativity. The Sister-Wife Project is part of an ongoing investigation of Ellsworth’s family lineage of Mormon polygamy focusing on those who often go unseen within this patriarchal construct. Ellsworth is interested in the visionary powers that historically have only been afforded to sanctioned male prophets of the Mormon Church. In 1832 Joseph Smith (founder of the LDS movement) had a revelation concerning the Civil War. Another Women’s Movement explores a historically relevant site and imagines a new community of women with their own revelatory potential and prophetic dance moves. Iconic actions from the history of female performance art become the tools of translation for Ellsworth’s sister-wives in Compounded. Inspirations for this piece are from Valie Export, Martha Rosler, Adrian Piper, Annie Sprinkle, and Shigeko Kubota.